If you want Americans to like Obamacare, giving them some money seems to help. A new poll reveals that previously uninsured people and those who received subsidies to buy health care under the Affordable Care Act are much happier with the new law than those who were forced to switch health care plans. Six in 10 of those who received subsidies to offset their insurance costs said they benefited from the law, according to the survey conducted by the Henry J. Kaiser Family Foundation in April and May. A majority of those who obtained their coverage via Obamacare's health insurance exchanges and half of the previously uninsured felt the same way. 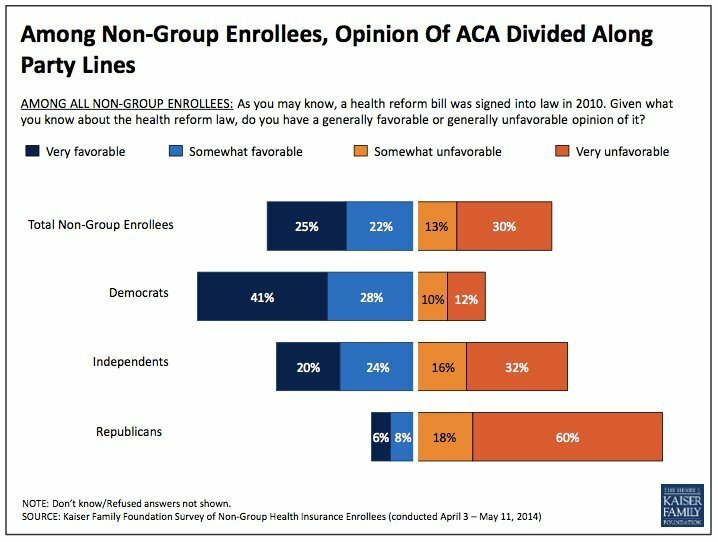 The poll focused on those who got health insurance in the so-called nongroup market, as opposed to people covered by job-based health benefits or government programs such as Medicare and Medicaid. Fifty-seven percent of consumers whose old policies were canceled because they didn't comply with the law feel they were negatively affected by Obamacare. And 47 percent of "plan switchers" who bought different coverage than they had last year said the effects were bad, although 46 percent of them say they are paying less this year compared to 39 percent paying more. Overall, 47 percent of those with individual insurance policies have a favorable view of the Affordable Care Act, compared to 43 percent who view it negatively. That's a higher approval rating than the public at large gives the act, according to the survey, but still shy of majority support. More than 8 million people obtained health insurance from an exchange through April 19, and millions more bought Obamacare plans from an insurer, agent or broker. Note: "ESI" stands for "employer-sponsored insurance." Among the major effects of the ACA was a disruption of the status quo that realigned the winners and losers in the individual insurance market, which previously was characterized by high prices or outright exclusion of older, sicker people; unaffordable coverage for the poor; and comparatively accessible insurance for younger, healthier consumers. By opening up this market to people with preexisting conditions and offering financial assistance to low- and middle-income families, Obamacare has begun to achieve its goal of broadening access to coverage, as well as mandating that insurance cover a standard set of benefits and provide a stronger financial protection against catastrophic bills. In doing so, however, the law also spread the additional cost of covering sicker people to those who previously had coverage and were advantaged by excluding others. And the mandated benefits and elimination of insurance tools such as annual or lifetime caps on coverage led insurers to eliminate less expensive plans that didn't include those features -- forcing their old customers to find replacements, often at a higher cost. Overall, 34 percent of people who have individual health insurance this year were uninsured before Obamacare, and 13 percent switched from one nongroup insurance policy to a different one for 2014. 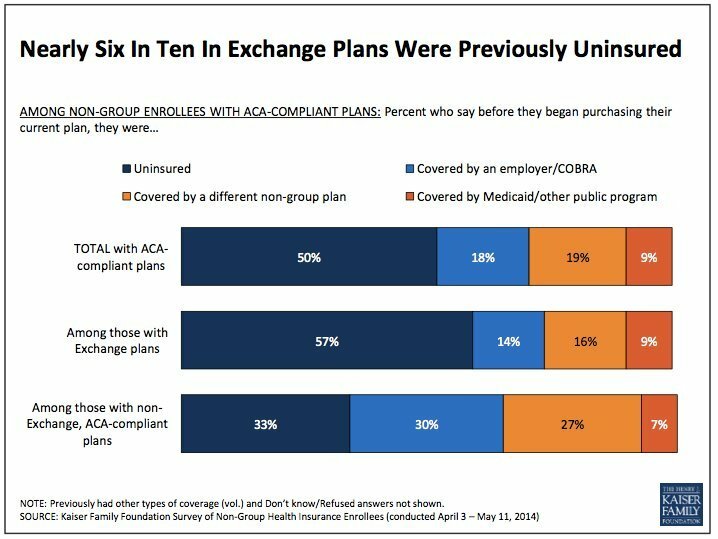 Among those who purchased their coverage from an exchange, 57 percent were previously uninsured. The survey also found that people with insurance plans that comply with Obamacare rules report slightly worse health than those in the old policies that excluded people with preexisting conditions. 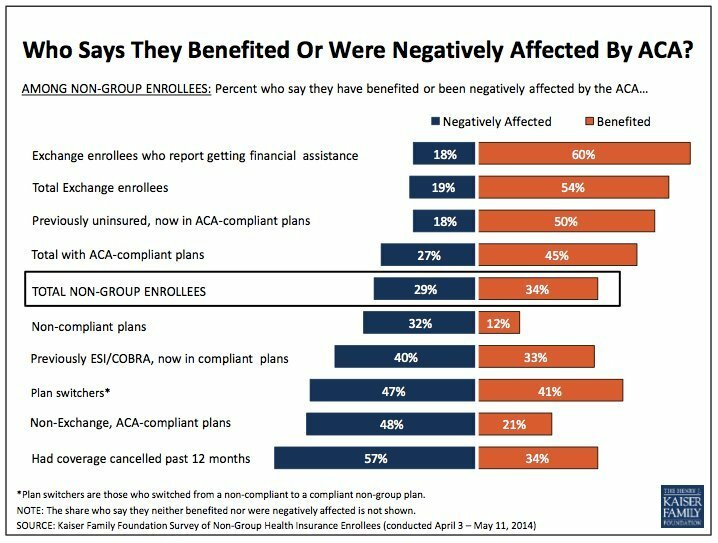 Seventeen percent of those with ACA-compliant insurance said their health is fair or poor, compared to 6 percent of those still covered by pre-Obamacare policies. The shares of those who reported excellent or very good health also varied, at 51 percent for those with ACA-compliant policies and 65 percent for those with pre-Obamacare coverage. Issues such as the affordability of premiums, future rate increases and the size of the plan's deductibles remain concerns for those who bought Obamacare plans, the survey shows. Consumers report being more confident that they can afford routine health care and that the insurance will protect them against major medical bills. Consistent with years of polling on the Affordable Care Act, partisan affiliation significantly influenced consumers' opinions about the law. Sixty-nine percent of Democrats view it favorably, compared to 14 percent of Republicans. CLARIFICATION: This post has been updated with more details about how many people who switched to Obamacare health insurance plans are paying less this year.